Laura Chapot and Shooting Star. Photos copyright Sportfot. Wellington, FL – January 15, 2016 – Laura Chapot and Shooting Star raced to a win in the $6,000 Illustrated Properties 1.40m Speed Challenge as the first week of the 2016 Winter Equestrian Festival (WEF) continued Friday at Palm Beach International Equestrian Center (PBIEC). The class concluded before inclement weather caused the cancellation of competition for the remainder of the day. 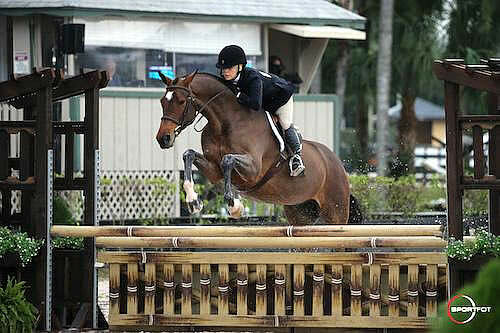 WEF, which kicked off on Wednesday, continues through April 3 and awards $9 million in prize money. Highlights of the first week of WEF include the $75,000 Battle of the Sexes on Saturday, January 16, at 7 pm, and the $75,000 Rosenbaum Mollengarden PLLC Grand Prix at 2 pm on Sunday, January 17. Both events will be live streamed at www.COTH.com. Chapot and Shooting Star, owned by Mary Chapot, broke the timer beam in 71.21 seconds early in Friday’s one-round speed class and kept the lead to top a starting field of 36 over a track set by course designer Eric Hasbrouck (USA). Andrew Kocher (USA) challenged Chapot with Prof de la Roque, but his time of 72.34 seconds came up shy and settled him in second for Postage Stamp Farm, LLC. Chapot answered back to take third aboard Out of Ireland in 73.15 seconds, while Luis Pedro Biraben (ARG) jumped into fourth in 74.25 seconds in the irons of Coriandolo Di Ribani for owner Miguel Madero. Amanda Starbuck (USA) piloted Carte Blanche to a time of 74.29 seconds to round out the top five for Starbuck Equestrian. Shooting Star, a 14-year-old Dutch Warmblood gelding (Phin Phin x Pion), has been under Chapot’s guidance for four years and, according to her, has found his niche in the 1.40m speed classes at WEF. Hasbrouck welcomed horses and riders alike back to WEF through his Week 1 courses, and Chapot was pleased with how Shooting Star handled the introduction. “It’s always hard to build the first week, but he’s done a fantastic job of getting everyone comfortable in the International Arena again,” she said. With 12 consecutive weeks of top competition ahead at WEF, Chapot consistently gives her horses a break during the fall and winter months. Shooting Star hasn’t competed since November and put his fresh legs to good use on Friday. “I am thrilled with the way he jumped. To have him step up the first week is a nice feeling,” added Chapot. Preceding Chapot’s victory, Friday competition got under way in the International Arena earlier in the day with a win for Tina Di Landri and Juanita in the $2,500 MAYBACH – ICONS OF LUXURY High Amateur-Owner Jumper class. Sophie Michaels and MCB Maya took the top spot in the $1,500 Sleepy P Ranch High Junior Jumper class while Laura Kraut rode Gipsy King to a win in the $6,000 Illustrated Properties 1.40m. Danielle Baran of Toronto, Canada topped an over fences class this week and was third in two others on her way to winning the Triple Crown Blankets Adult Amateur Hunter 36-49 championship. Riding her own gelding Vizcaya, the duo is no stranger to the winner’s circle and also took a victory under saddle. While training under Canada’s Chris Sorenson and Darcy Hayes (USA), Baran and her mount have won two consecutive WEF circuit championships in the Adult Hunter division. “He’s a real ham in the barn and a little bit persnickety, but once you get him in the ring he’s all business,” she added. Baran will spend the rest of the season in Wellington and looks forward to more success throughout the 12-week circuit. Bridget Hallman and Lulu earned the Adult Amateur Hunter 36-49 reserve championship after claiming three second-place ribbons and one third-place ribbon over fences. The first week of WEF continues on Saturday with the $25,000 Suncast 1.50m Classic and $75,000 Battle of the Sexes, which is the first Saturday Night Lights event of the season. Also on Saturday, the E. R. Mische Grand Hunter Ring will feature the conclusion of the EnTrust Capital Small Junior Hunter 16-17 division. Competition will come to a close on Sunday with the $75,000 Rosenbaum Mollengarden PLLC Grand Prix, held in the International Arena. For more information and full results, please visit www.pbiec.com. Lindsay Brock and Callie Seaman for Jennifer Wood Media, Inc.